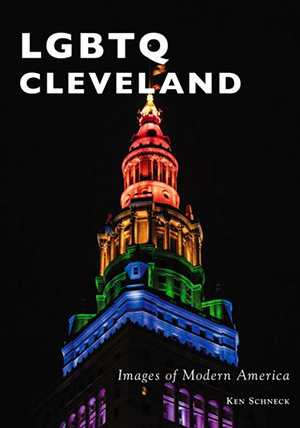 The new book LGBTQ Cleveland: Images of Modern America showcases over 150 photos depicting five decades of Cleveland's LGBTQ history (including some by FreshWater's own Bob Perkoski). But along with a vibrant collection of images, local voices and stories shine through—thanks to author Ken Schneck's dogged efforts to bring them to light. When Schneck took on Arcadia Publishing’s sixth addition to its city-by-city series documenting the nation’s LGBTQ history, he was told everything he’d need would be in the library or at the Western Reserve Historical Society. Cut to Schneck tracking down photos, stories, and artifacts all over Cleveland. Seeking out LGBTQ “elders,” he was led to basements, attics, and dining room tables, where he pieced together the most accurate and complete portrait he could. Among those elders were Brynna Fish, a Cleveland Pride coordinator who gave Schneck hundreds of photos from Pride festivals and celebrations, and Brian DeWitt, former editor of the Cleveland-based Gay People’s Chronicle. Despite his thorough digging, Schneck felt there was still more to be uncovered. “There were so many stories I wanted to tell, but there weren’t images that corresponded to them,” he shares. In particular, Schneck found that many of the artifacts documenting the experiences of black LGBTQ community members were largely lost, so he did his best to weave in those stories, as well as stories of violence in the transgender community and community members who were shunned during the AIDS crisis. Drag Queen Lady J Martinez featured in Chapter Two Schneck, who teaches courses on antiracism, ethical leadership, and creating community-based change at Baldwin Wallace University, is used to discussing important issues that still require work. He hopes people walk away after reading the book with the sense of the power of “what an individual voice can do, and what voices can do when they come together." Schneck’s first book Seriously…What Am I Doing Here? The Adventures of a Wondering and Wandering Gay Jew accustomed him to chronicling his own adventures. He also hosted the award-winning podcast, “This Show is So Gay,” for a decade. Though his own voice isn’t in his newest title, his own journey and choice to focus on people rather than places guides the book’s energy. A launch party for LGBTQ Cleveland will kick off at 7 p.m. May 30 at Jukebox (1404 W. 29th St.).